Toronto – Outcries of public rage met the announcement that Michael Bryant would not be charged in the death of Darcy Allen Sheppard, a Metis bike courier from Toronto. Richard Peck, the special prosecutor assigned to the Bryant/Sheppard case, says that the public interest could not have been taken into account in his decision not to prosecute the former Provincial Minister. Peck has remained a popular appointment with Provincial governments. He has now been appointed to asses whether charges should be laid against the officers who killed Robert Dziekanski, the Polish immigrant killed after police tasered him five times 30 seconds after confronting him. A previous statement from the BC criminal justice branch released by Stan Lowe, stated that they unanimously believed that criminal charges against the 4 officers were not necessary. Lowe was appointed as the BC Police Complaints Commissioner two weeks later. Bryant’s car can be seen on public surveillance video (see below) striking Sheppard and then driving off with Sheppard attached to his car, yet the defendant claims that Sheppard attempted to attack him before he drove off in his car, killing Sheppard. Lawyer Bob Mionske at Bicycling Magazine published this well written piece about the case today. When a cyclist is killed by a driver, justice is nearly always stacked toward the driver. And in this case in Toronto, the scales were tilted even more than usual. On August 31, 2009, the worlds of two strangers collided in the posh Bloor Street shopping district of Toronto. 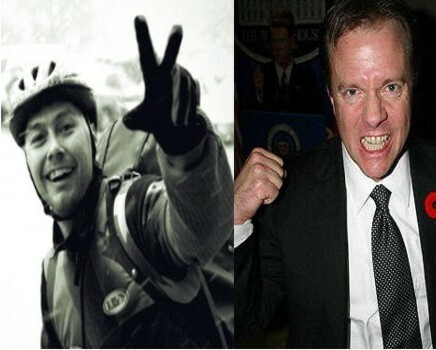 In the aftermath, one of those strangers, a bicycle messenger, lay dead, while the other stranger, the former Attorney General of Ontario and a rising political star, stood accused of causing the cyclist’s death. About a year later, on Tuesday, May 25, 2010, Richard Peck, the special prosecutor appointed to try the case, dropped all charges against Michael Bryant, the former Attorney General accused of causing the death of bicycle messenger Darcy Allan Sheppard. I can’t say I didn’t see this coming. From the beginning, this case involved more than just an encounter between a cyclist and a motorist gone awry. As I noted in When Worlds Collide , issues of race, class, and power were a subtext to this case from the moment that Bryant shut off his car’s ignition in the driveway of a luxury hotel, after fleeing the scene where Darcy Sheppard lay dying in the street. The rule of law means that a nation is governed by laws, rather than by the caprices of the powerful few. It means, among other things, that nobody, rich or poor, powerful or powerless, is above the law. It means that even the powerless can find justice under the law, and that even the powerful can be brought to justice. It’s an idea that is ingrained in western society. Bryant had been charged with criminal negligence causing death and dangerous operation of a motor vehicle causing death in relation to the death of cyclist Darcy Allan (AL) Sheppard after a traffic altercation on August 31, 2009. Most cases end with the ruling of a judge or jury but this case ended with the ruling of a single criminal defence lawyer acting as an independent prosecutor. Peck released an eleven page brief analyzing some of the evidence and justifying his decision to drop the charges without a preliminary hearing of the evidence. His brief answered few questions but also raised many more. We have separated Peck’s brief into the two parts. Part one focuses on the initial incident where Bryant’s vehicle rammed into Sheppard. Part two will begin where Sheppard grabbed on to the vehicle. An analysis of Richard Peck’s brief reveals that he relied heavily on the unchallenged statements of Michael Bryant to come his decision to drop the charges. Peck cherry picked evidence to support Bryant’s claims and either suppressed or ignored alternative evidence that challenged Bryant’s version of the events. Michael Bryant’s case put over until April 14. Bryant did not appear. Disclosure is now complete. Michael Bryant was a no-show in court once again today but the criminal case against him continues to move forward. Bryant’s lawyer, Marie Henein received the police reconstructionist report which is the final major piece of disclosure. Mark Sandler appeared for the Crown before Justice Paul Bently at the Old City Hall Court. The case was put over until April 14. Now that disclosure is complete Bryant will elect how he wishes to be tried. He may choose to be tried in the Ontario Court of Justice in front of a judge only, or in the higher court, the Superior Court in front of a judge alone or a judge and jury. Bryant is the former attorney general for Ontario who worked closely with Crown prosecutors and judges. Independent prosecutor, Richard Peck, from Bryant’s home province of British Columbia will represent the Crown in the criminal trial. Bryant has been charged with criminal negligence causing death and dangerous operation of a motor vehicle causing death in relation to the death of cyclist Darcy Allan (AL) Sheppard after a traffic altercation on August 31, 2009. Video evidence shows Bryant deliberately rammed his car into Sheppard from behind before attempting to flee the scene of the attack. Sheppard grabbed on to his car and Bryant fled with Sheppard attached. Witnesses then say that Bryant sped away at about 90 km/hr on the wrong side of the road. He mounted the curb and intentionally drove into obstacles to knock Sheppard off his car. Sheppard died from the resulting multiple collisions. Former Ontario attorney-general Michael Bryant has been charged with criminal negligence causing death and dangerous operation of a motor vehicle causing death in relation to the death of cyclist Darcy Allan (AL) Sheppard after a traffic altercation on August 31, 2009. Much has been written about the case as it continues to wind its way through the justice system but here is a summary of the facts of the case so far. The surveillance video shows Bryant pull to a stop at a red light. Then we see Sheppard pass Bryant and stop in front of Bryant’s car at the red light. We don’t know if any altercation happened before the video begins but neither Bryant not Sheppard exchanged words or seemed enraged or threatened at this time. The video then shows the light change to green. Sheppard has his back turned to Bryant. Sheppard doesn’t move so Bryant twice moved his car toward Sheppard. The two seem to exchange words and then Bryant deliberately rammed his car into Sheppard, knocking him to the ground. The key piece of video evidence shows that Michael Bryant was the aggressor. It factually documents his deliberate attack on Sheppard. John West, senior partner at Ogilvy Renault‘s Toronto office, said Bryant is working with the firm’s energy law team. “Michael is a person we believe brings a lot of value to the table. We recognize that in some quarters it could potentially be viewed as controversial … it’s just a human tragedy all around,” West said Friday. “But, as lawyers, we believe in the rule of law … and that means we believe first of all in the presumption of innocence and Michael is entitled to the same treatment and respect that you and I are. Bay Street law firm, Ogilvy Renault, with offices high atop the golden towers of the Royal Bank Plaza, certainly has the legal right to appoint Bryant to a privileged position but if the firm is only providing Bryant with the same treatment that all of us are entitled to then I’m sure Mr West could quickly name all of the other accused killers he has hired or that are currently employed by Ogilvy Renault. The presumption of innocence applies to the rule of law. It doesn’t necessarily apply to hiring decisions and the public doesn’t require a criminal trial and a ruling by a judge to form an opinion. The public can watch what happened on video or listen to eyewitness statements as Michael Bryant’s “innocent until proven guilty” behaviour was captured live in front of many witnesses. “It would, however, be unfair to you, the (Invest Toronto) board and above all to the residents of Toronto to allow this event to distract from the vital efforts of Invest Toronto,” the statement says. In other words, Bryant’s employment at Invest Toronto is wrong but his employment at Ogilvy Renault is entitled. What we can conclude from Michael Bryant’s statement and Ogilvy Renault’s hiring decision is that Ogilvy Renault and its senior partner, John West, have much lower ethics and standards than Invest Toronto and other firms. Michael Bryant was a no show for his first two court appearances on October 19 and November 16. Provincial Court Justice Paul Bentley, will meet behind closed doors with the all parties for a judicial pre-trial on November 30. Bryant’s next court date is December 7, 2009. Torontonians are anxiously awaiting his first appearance in court. Michael Bryant was charged with criminal negligence causing death and dangerous operation of a motor vehicle causing death after running over and dragging cyclist, Darcy Allan Sheppard, on August 31, 2009.